If your current accounting method is strictly accrual, you're using professional accounting oversight and you're not concerned with real-time inventories and/or managerial (cost accounting you've already selected Accounting Method A (Accrual Focus). What Does Method A look like? 2. Limited cash accounting. Producing a cash-basis Schedule F tax return will likely require meticulous external adjustments. 3. Partial inventory tracking. Even if your accounting system includes an inventory module it's likely not easily adaptable to the detail and dynamics of agricultural inventories so you probably will also rely on separate forms or spreadsheets. 4. "Mainstream" GAAP accounting that reliably reports historical financial activity at the expense of farm management detail. What are the benefits of Method A? 1. Can produce accrual financial statements that accurately compute profitability. 2. Anyone with an accounting background can understand the reports. 3. Will work with an "off-the-shelf" accounting program rather than more expensive and specialized ag accounting software. 4. Doesn't require that your controller or bookkeeper understand agriculture. What are the downsides of Method A? 1. Hard to monitor cash tax position because of the timing differences in cash and accrual transactions. 3. Restricted accounting control because of the challenges of inventory control or reconciliation. 4. Requires formal accounting training to maintain. Many larger farmers"choose Method A strictly on the advice of their CPA, controller or CFO because it's what these professionals are already comfortable with. 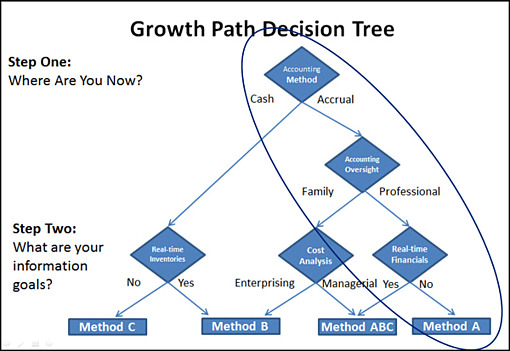 Method A, while highly-sophisticated, may not take you to your ultimate destination. Be prepared to follow the Growth Path we'll describe in upcoming articles.